Some time ago, after we had only been in South Africa for about a month, I posted a description of our “new normal.” Now, nearly five months in, it is safe to say that our new normal is infinitely stranger. It’s just that we don’t always notice. Until it slaps us in the face. The scary thing is that I knew exactly what she meant. When my mom and my Mike were here, they observed that our patterns of speech and word choices had already changed, both in subtle and occasionally dramatic ways. We’ve previously blogged about things like “howzit?” and must vs. should, but now we are truly speaking like locals. Well, almost. I’ve started using “Heita!”, a sort of township greeting, with the security guards and gardeners on campus, and we’ve both started using the phrase, “Is that fine?” (with a necessary lilt on the word fine) when confirming a date/time for a meeting, when requesting an outside table at a restaurant or just generally when asking whether we are allowed to do something. But the “gogos and chickens” comment takes us to a whole new level. Fortunately, there is a simple explanation. You may recall that we celebrated Jenny’s birthday twice, once at Moyo and once in Mamelodi. 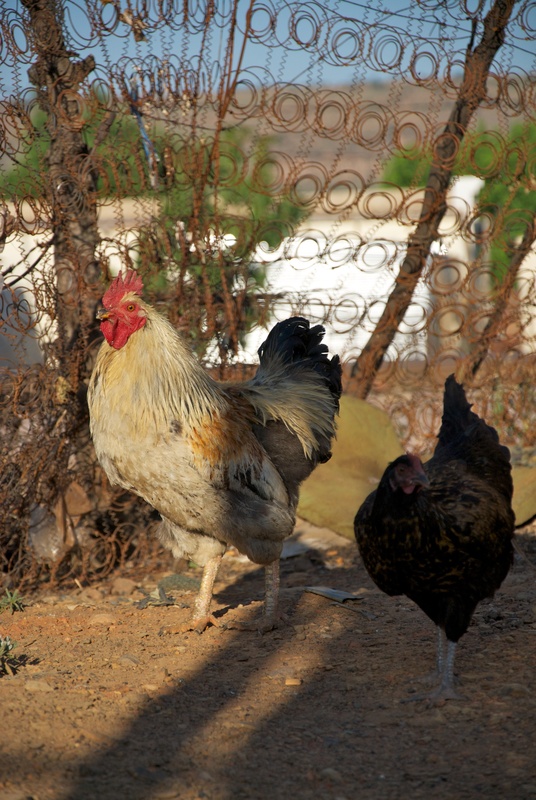 In Mamelodi, Ephney introduced us to some of her neighbors — two older women, grannies, or “gogos” — who have in their mattress-coil-fenced yard a few (free-range, shall we say) roosters and chickens that became the subjects of some photos I took that day. Because the gogos were so kind to us and had asked me to take several photos of them and their house, I decided to have a dozen or so photos printed for Ephney to share with them, including one of the chickens. However, as she was riding the train home one day, Ephney let one of her friends peruse the photos. That friend, for one reason or another, wanted to keep the photo of the chickens. So, Ephney gave the remaining photos to the gogos and told them that there is also one of the chickens. What she didn’t tell them is that her friend took it. Instead, she told the gogos that we have the photo of the chickens hanging on our wall. Yeah…not yet. “How are your white people?” the gogos asked Ephney the other day. I suppose she said we were fine, but what they really wanted to know was whether they could get that picture of their chickens. Yes, of course. I will print another one just now.